June 12, 2015 -- At a ceremony attended by dozens of Sea Cliff residents this past Tuesday night, the Sea Cliff Civic Association recognized former Village Trustee Carol Vogt as this year's recipient of the organization's White Cap Award. 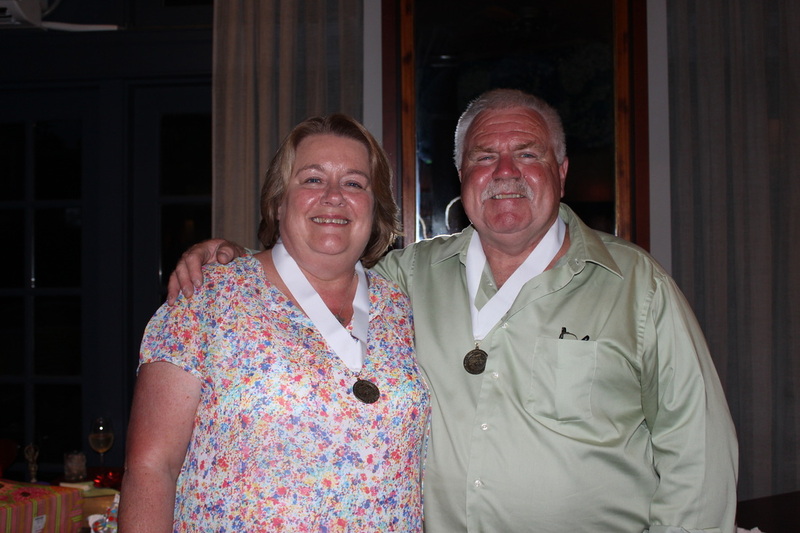 The prestigious honor is bestowed each year upon individuals, groups or organizations that have demonstrated repeated outstanding volunteer service to the Sea Cliff community. The Metropolitan Bistro, which generously contributed an extensive assortment of hors d'oeurves, hosted the event. "I can feel the excitement building," declared Civic Association President Ann DiPietro, during her opening remarks - the recipient's name traditionally a tightly guarded secret until it is announced that night. Mayor Bruce Kennedy was then called before the packed room to reveal this year's nominee. He spoke of those who selflessly offer themselves in service to the community without seeking accolades, and offered that those who do, have "lives that are much richer and happier than those who insisted on recognition for these good deeds." After teasing, "it is important for us to recognize these people - even if it means embarrassing them a little," the Mayor announced this year's winner. The Mayor spoke of Ms. Vogt's nearly four decades of service to the community since moving to Sea Cliff in 1976 - as a member of the Waterfront/Environmental Committee, the Beach Committee and the Civic Association, as well as on the Landmarks Association, the Zoning Board of Appeals, and the Planning Board, before being elected to her first of three two year terms on the Village Board in 2009, the same year Mr. Kennedy was elected Mayor. He described Ms. Vogt as a trustee who emphasized the importance of communication, and hearing from as many sides as possible before reaching a decision on an issue. "Carol cares not only about doing the right thing," he said, "but making everybody feel good about the process." This quality was perhaps best demonstrated during the year and half process during which the Village Tree law was revised and adopted, with Ms. Vogt repeatedly emphasizing the importance of balancing competing interests, and pushing for repeated meetings during which residents could offer input, allowing the board each time to tweek the proposal before ultimately adopting it. "Carol is an example to me," said Christine Abbenda of the Civic Association said during her remarks. "Her service is something we should all aspire to." Resident Dan Dipietro spoke of working with Ms. Vogt to save the Sea Cliff Little League when it fell on hard times during the 1970s. During that time, he explained, he learned four things about Ms. Vogt - "She's really, really smart; she listens - and those two things don't ofter go together; She cares, boy does she care; and, she sorely lacks ego." "If it were up to me you would be getting the tsunami of White Caps Awards." Ms. Vogt's son, Justin then addressed the audience speaking of his mother's civic virtue. "Its people like you, mom," he said, "that make a community work." In recognition of Ms. Vogt's service as board liaison to Sea Cliff Beach during her tenure as Trustee, Beach director Ann Koppel presented the White Cap award winner with a Sea Cliff Beach t-shirt and a Len Jacobs photograph of the beach. "I am just so overwhelmed...because I got so much more back," said Ms. Vogt in response. "This community has given me so much more than I have given it." 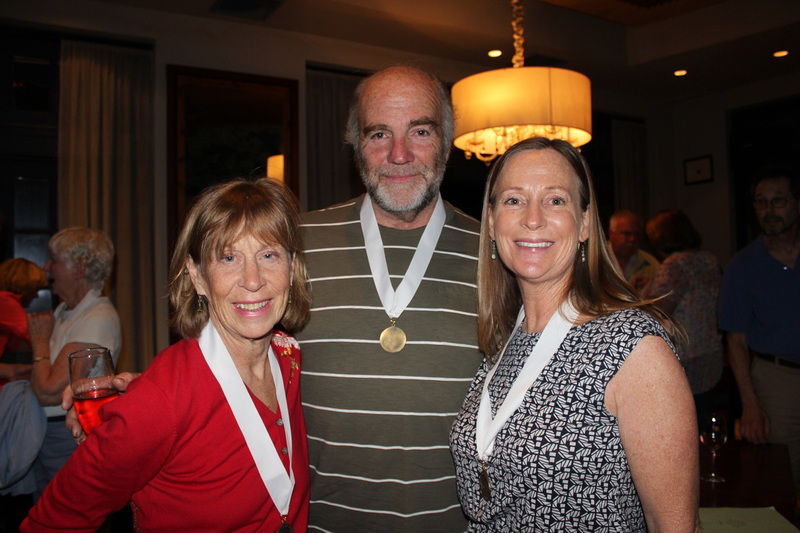 Past White Cap Award winners at this past Tuesday Night's celebration. Above - Gwynne Lennon (2007), Mike Lennon (2007), and Laura Kavanaugh (2002). Below - Debbie Pierce (2014) and Jack Pierce (2009). What a privilege it is to take part in this annual ceremony. Each year, after meticulous consideration, the members of the Sea Cliff Civic Association choose a deserving recipient of the prestigious White Cap Award. This honor is bestowed to individuals who have demonstrated repeated outstanding volunteer service to the Sea Cliff community. An older gentleman who befriended me many years ago and became a mentor to me, instilled upon me that giving of one's self was its own reward. He used to tell me that my job every day was to do something good for someone else but I couldn’t tell anyone else. Over the years, I have learned to watch the actions of others and have gravitated toward these selfless givers and have witnessed that their lives were much richer and happier than those who insisted on recognition for good deeds. With that said, it is important for us to recognize these people – even if it means embarrassing them a little. This year’s deserving recipient of the White Cap Award has led a life of true public service. My good friend Carol Vogt moved to Sea Cliff in 1976 and began volunteering virtually immediately. She has been a member of the Waterfront/ Environmental Committee, The Beach Committee and The Civic Association (still heading up the 4th of July celebration in true Sea Cliff fashion). Carol has served on the Landmarks Association, the Zoning Board of Appeals, and the Planning Board. Carol was elected a Village Trustee in 2009 and served three 2-year terms. As Village Trustee, Carol served as Liaison to Senior Action Committee, the Beach Committee, the Museum Board, the Landmarks Preservation Commission, the Mutual Concerns Committee, and the Tree Preservation Committee. My experience with Carol began when we served together on the Planning Board. I was immediately impressed with the fact that Carol was always prepared for hearings. She had reviewed the applications, examined the plans, visited the sites and had a list of questions prepared for the applicants (bullet pointed in alphabetical order with correct grammar and punctuation). We were both elected to the Board of Trustees in 2009 and after serving in this capacity for one year; it was obvious that she should be appointed as Deputy Mayor. While my main focus was immediately on the financial issues of the Village and improving support for our local businesses, Carol was just as concerned with improving dialogue and communications with our residents. While I may have had grand ideas about the mission of the administration and Carol would give her support; she would ask me questions like “Don’t you think we should explain this to our residents?” Carol is always interested in hearing all sides; she wants everybody to feel “heard”. Carol cares not only about doing the right thing but making everybody feel good about the process. Carol is kind, thoughtful, and sensitive to the needs of the people around her. She is also one of the strongest and hardest working people I have ever had the pleasure of working alongside of. The world is full of good people. Noble, selfless, generous people who help those in need, who continue to push when the world says retreat, who embody the better angels of our nature. Carol is one of these people. Carol is a devoted wife, a nurturing mother and a doting grandmother. She is a faithful friend and a steadfast public advocate. There is no one more dedicated to the needs of her community or a more worthy recipient of the White Cap Award.